It’s been a busy couple of weeks for exoplanetary discoveries, but also for me, which explains why I’ve taken so long getting round to writing about them. On the 28th of August, the Kepler mission announced the discovery of a unique binary star two planet system. The Kepler 47 family consists of a binary pair, a G-type star – about 84% as massive as the Sun, and a smaller M-type red dwarf roughly 36% of the Sun’s mass, but only 1.4% as luminous. Two planets have been observed to be orbiting the pair. The closest is of these is Kepler 47 (AB) b, estimated (from mass-radius relationships) to be between 7 and 10 Earth masses, but the error on this figure remains large. The outermost planet, Kepler 47 (AB) c, is Neptune-sized (16 – 23 Earth masses) and is orbiting within the habitable zone, although due to its large mass it is unlikely to fulfil the traditional requirements for planetary habitability. The configuration of the Kepler 47 system illustrates the fact that stable multi-planetary orbits can exist around binary stars, and brings the total of circumbinary planets to six. In other news, a new planet was added to the Habitable Exoplanets Catalog (HEC) on the 29th of August, bringing the total to six (including: Gliese 581d and g, Gliese 677Cc HD 85512b, Kepler 22b). Super-Earth Gliese 163c was established to be orbiting within the habitable zone of its 0.40 Solar mass star by an international team working at the European HARPS project. It completes an orbit in 26 days and has a mass no less than 6.9 times that of the Earth. 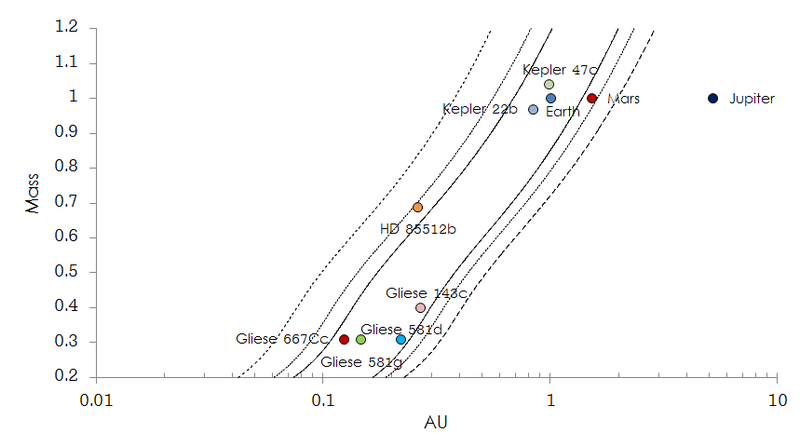 The custodians of the HEC database have given Gliese 163c an Earth Similarity Index (ESI) rating of 0.73, establishing it as the 5th ‘most habitable’ exoplanet discovered to date, despite exhibiting possible surface temperatures of 60 °C or above. Speaking to online science network io9, HEC lead scientist Professor Abel Méndez in the Planetary Habitability Laboratory at the University of Puerto Rico at Arecibo said, “Gliese 163c ranks fifth in our current list of six potentially habitable exoplanets because it is nearly twice the size of Earth and its temperature is also higher, but it’s still an object of interest for the search of biosignatures by future observatories.” The HEC has yet to assess Kepler 43 (AB) c, but it is not likely to fare well in habitability assessments due to its large mass. It’s certainly an exciting time to be working in this field; nearly each new week brings another interesting discovery. Keep looking up!